Photobiont [fo-to-BY-ont] (noun): The photosynthetic component of an organism living in symbiosis. “Photobiont” relates specifically to lichen, a super neat symbiotic organism with a fungal component as well as a photosynthetic component, which work together as a single unit! The photobiont in lichen can be either green algae or cyanobacterium. 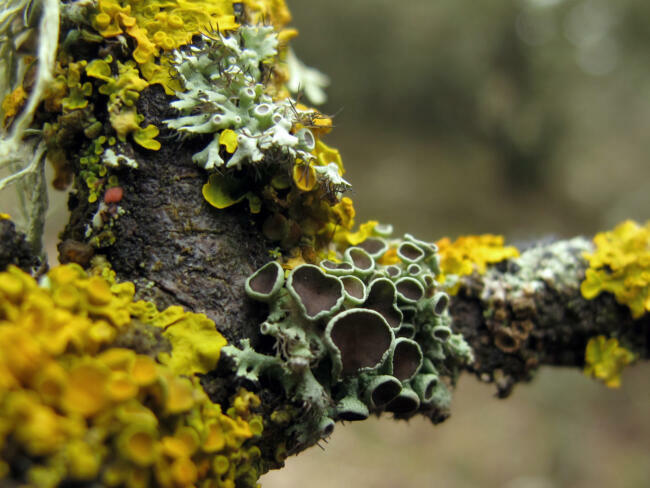 Lichen is so much more than just that flaky, light green thing that grows on tree bark! They come in so many different colours, shapes sizes, and play a key role in many different aspects of the environment, like the food chain and nutrient cycling. Lichen can even be used as a reliable biological indicator of air pollution, since they are sensitive to atmospheric pollutants. The winter is a great time to see lichen because it is more noticeable thanks to all of the white snow. If you’re keen on exploring lichen and more of nature’s interesting symbiotic relationships, you can join us on our “Fantastic Friendships” Family Nature Walk happening on February 9, at 1:30PM!